For the past week, we have been in Ohrid, Macedonia. For a week before that, we were in Sofia, Bulgaria. Both cities are in the Balkans and both spent decades under Communism. However, that’s about all these two places have in common. Whereas Ohrid is dynamic and thriving, Sofia gives every indication of needing a Prozac. Sofia is a positively gloomy place. Many of the buildings are crumbling. You look at some of them and see rebar showing from the bottoms of balconies – not a place you’d want to be in an earthquake. Many of the roads are rutted and potholed. And the sidewalks! Dear God, pushing Ian in his buggy in Sofia was pretty difficult in a lot of places. It also seemed pretty unfair for him to be jostled about so much, so we often just carried him instead. 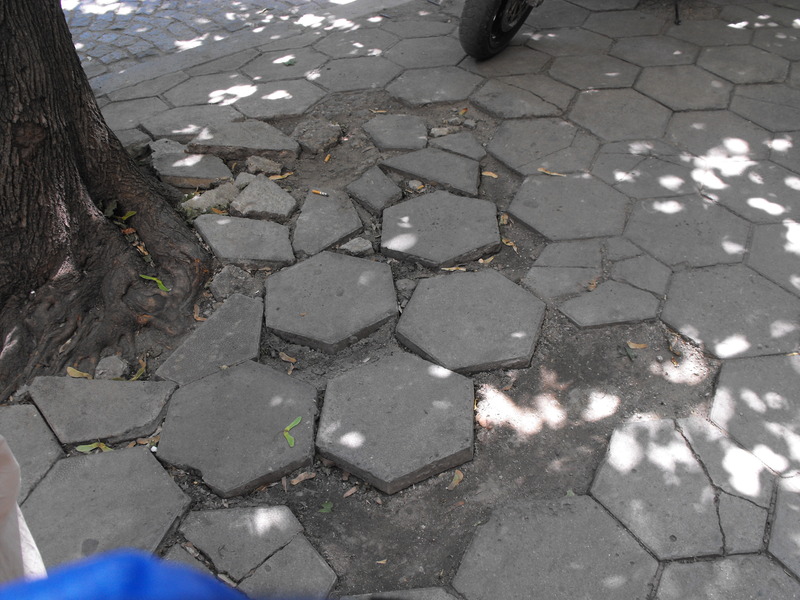 Typical Sofia sidewalk. Pretty tough to push a baby buggy on one of these! If Sofia had a lot of interesting places to see or really vibrant people, none of this would have mattered. Unfortunately, Sofia does not have a lot of attractions and most of the people seem sad. You can see all the sights in about three days, and the gloominess of the place makes you want to leave before that. No shock that drinking is a bit of an issue in Sofia. Really cheap beer and hard liquor is available everywhere. Walk about twenty metres in any direction, and you’ll find a bottle of vodka just waiting for you to take it home or to the park – a popular drinking place. I remember seeing a granddad out at the park with his granddaughter at nine one morning sitting on a bench. Cute scene, except for the liter bottle of beer the old man was working on. 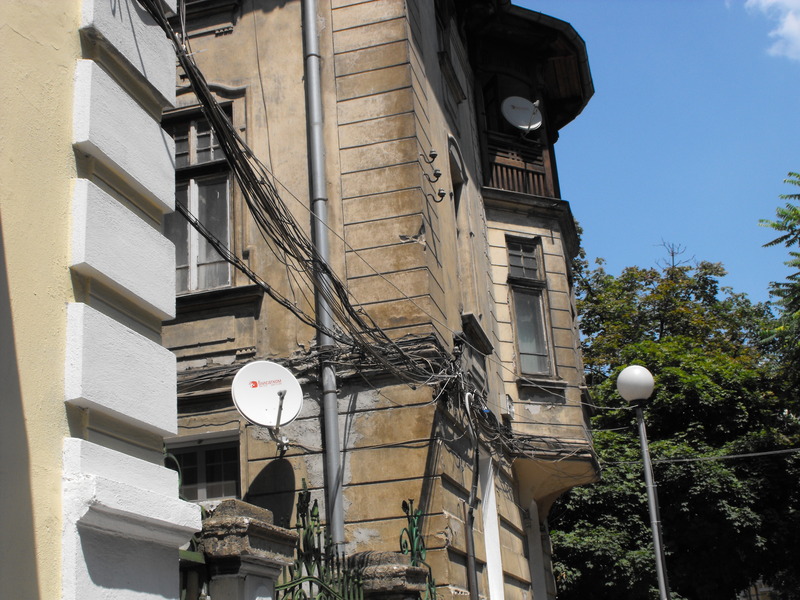 In Sofia, you get the sense that people have either given up or don’t know how to even begin improving their lot. Many times, I saw locals sitting deep in thought, looking depressed – as though they had only one or two bad options in life and were thinking really hard in the hopes that maybe, just maybe, they had somehow overlooked one good option. Typical crumbling building in Sofia. 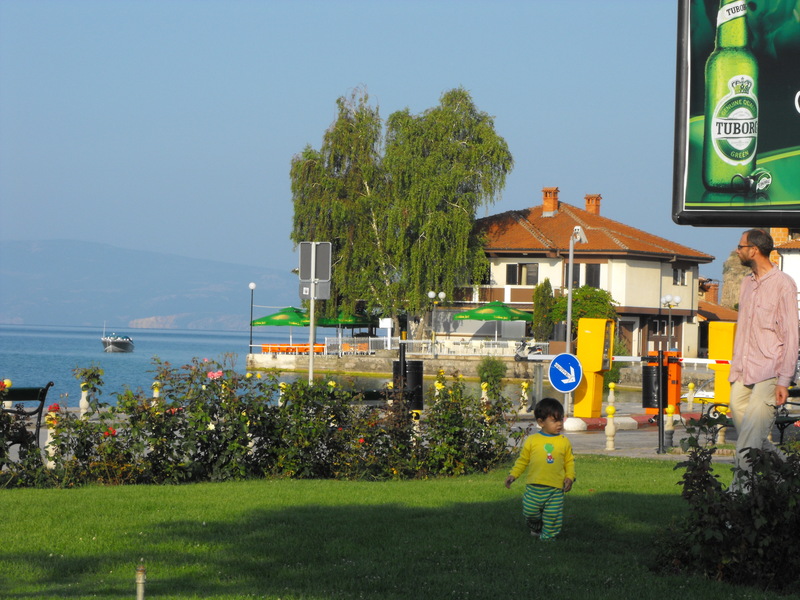 Ohrid, by contrast, is a vibrant and happy place with lots of friendly people. I guess it’s easy to be happy here – big, beautiful lake, mountains, gorgeous old town and a thriving tourist industry. But the thriving tourist industry is not something that happened by accident. They had to plan it and work hard at it. They also have to work hard at maintaining their city’s infrastructure and buildings – and at planning the city so that it is an appealing place to visit and to live. Ian playing in a park by Ohrid's lakefront. There seems to be something about the people in Ohrid that makes them more resilient than the folks in Sofia. Sure they’re pretty poor by Western standards, as are Sofians, but they don’t seem to let that get them down. They don’t seem like they’re busy resenting their lot in life. They do seem pretty busy improving it, though, and I guess that’s one of the main reasons that Ohrid wins over Sofia hands down. We can’t wait to come to Ohrid again, but we will never visit Sofia again. 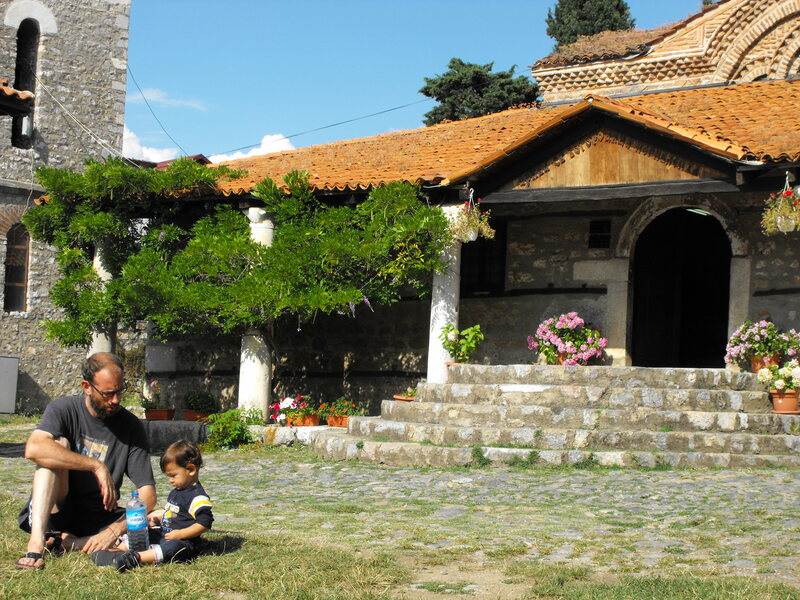 Ian and I at one of the beautiful old churches in Ohrid's Old Town. Nice pasty white legs I'm sporting, eh?